Previously we already discussed basics of single phase transformer and three phase transformer. We also discussed about three phase transformer connections or Vector Groups. Now, here we will discuss about auto-transformers. Auto transformers have several applications. But first we will develop some basic concepts of autotransformer. Before proceeding further one should have some basic knowledge of transformer. Auto transformers can be made in two ways. In one way it can be realized by additively connecting the primary and secondary windings of the two winding transformer. In other way the autotransformers can be thought of built as a single unit with one continuous winding. We will start from first approach and move to second. Let us first consider a normal single phase two winding transformer. 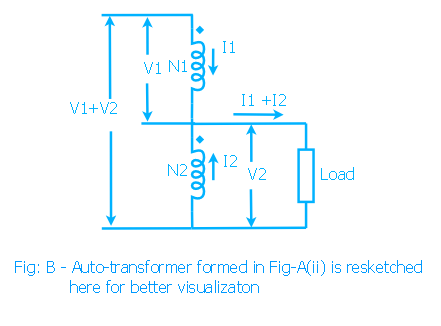 The schematic diagram of a transformer is shown in Fig-A(i). We will obtain an autotransformer from this usual transformer. For the purpose of simplifying the analysis the transformer is considered as ideal. 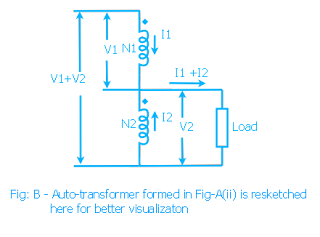 (In case of power transformer the ideal transformer analysis gives quite accurate result). 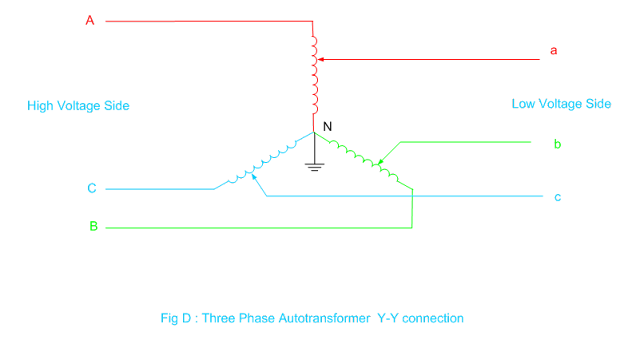 The autotransformer analysis can be very simple if you recall two important concepts of a transformer. secondary winding irrespective of changes in connections. It means current I2 that flows in secondary winding is associated with current I1 in primary winding according to above mmf balance formula. In Fig-B the primary of autotransformer is taken across both the windings where as secondary is across N2 winding. The autotransformer is so loaded that the secondary current is I1+I2 . It makes the current flowing in the windings as I1 and I2 which are the rated values. But (1 + N2 /N1) is always greater than 1. Hence by forming an autotransformer the capacity of the resulting autotransformer is always more than the original isolated winding type transformer. In the so formed autotransformer it should be remembered that the voltage and current through the windings remains as before i.e the rated values. From the above formula it is clear that larger value of N2/N1 gives larger capacity of the autotransformer. From this formula it is clear that if N2 /N1 is made large to increase the capacity then the voltage ratio between primary and secondary of autotransformer approaches 1. For this reason auto transformers are advantageous for use in power network when the voltage ratio between both sides is near unity. It is used in grid substations as interconnecting transformers (ICT). The autotransformers are used to interconnect two different voltage levels. For example interconnection of 400kV and 220kV, 735kV and 345kV and 765kV and 400kV etc.. The voltage ratio should be less than 3:1 for more advantageous use. As we said N2 /N1 should be large for adavantageous use. The current I2 flows in the common winding of the autotransformer. 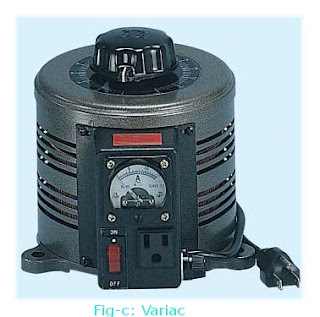 Hence the auto transformer can be designed with N2 number of turns made of conductor of smaller cross section area, so resulting in a big saving.The autotransformers are cheaper and lighter in comparison to two winding transformers. Just looking at the sketch you may think that instead of connecting two windings in additive ways. Why should not it be made of single winding and one terminal brought out from the middle as per requirement. Yes this is true and the autotransformer can be thought of made of a single winding having a part of winding common to primary and secondary . Sometimes this method is used to obtain a variable secondary voltage. This case it is so designed that the middle contact can smoothly slides over the coil. It is commonly used in the academic electrical laboratories. This is usually called as Variac(Fig-C) or Dimmerstat. There are some other terminologies adopted by different manufacturers. In this design it is not possible to adopt conductors of two different cross sectional area as in case of ICT where turns ratio is fixed(due to fixed voltage ratio) between primary and secondary. Autotransformers are also used for voltage regulation in distribution networks, for starting of induction motors and as lighting dimmers. Autotransformers are also used in electric traction. One main disadvantage about autotransformer is that the primary and secondary are electrically connected. So the electrical disturbance i.e high voltage transients from one side can be easily transmitted to the other side. The other disadvantage is that the impedance of the autotransformer is considerably low, so the short circuit current will be more. More over an open circuit in common winding results in full primary side voltage across the load which is harmful. But in several cases the advantages outweigh the disadvantages. First thing is that the theory of single phase autotransformer is the basis of three phase autotransformer. Three single phase autotransfor bank can be used for forming a three phase transformer or a single unit three phase autotransformer can be built. The three phase autotransformers (see Fig-D) are connected in star-star(Wye-Wye). If the autotransformers are connected as Delta-Delta, then phase difference between primary and secondary exist which is not desired (See Vector Groups). 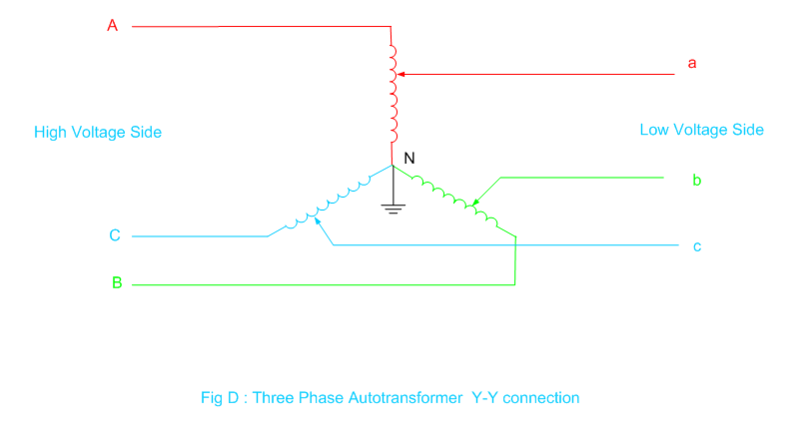 In three phase Y-Y connected power autotransformers an additional delta connected winding is used to take care of zero sequence currents (for unbalanced systems), and third harmonic currents. Although we discussed here is for one particular case still we revealed the general approach. If you wish to connect load across the other winding, then you can proceed in a similar way. Moreover the above analysis is for step down case. You can easily analyze for step up case by interchanging the position of source and load. In this case the direction of I1+I2 is reversed so also the directions of I1 and I2. It should be recalled again that the change of direction of current in series winding is associated with change of direction of current in common winding to satisfy mmf balance. Hi very nice blog regarding Auto Transformers. Found it very useful. Thanks for posting. Nice explaination thank you.. and why cant u add a numerical example(just a suggestion)??? what is cooling of auto transformer? Transformers are manufactured in a variety of designs and in relatively short batches to meet the demands of customers who always have different expectations. There are a range of solutions that can be applied to build different collections of transformers. Nice Blogging on Electrical, Thanks for this good information for beginners. Why we use auto transformer between two switchyard? what i dont understand is that there is only 1 windage. does that windage induce itself to a lower voltage?